NYC, 11/09/2018, 2:00PM. 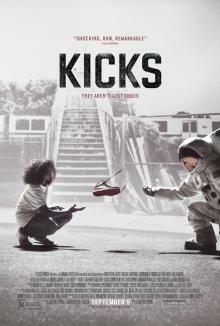 Kicks (2016): Adventure of teenagers. Brandon is a 15 year old whose dream is a pair of fresh Air Jordans. Soon after he gets his hands on them, they're stolen by a local hood, causing Brandon and his two friends to go on a dangerous mission through Oakland to retrieve them. Starring Jahking Guillory, Christopher Jordan Wallace.